There is a tradition that lame duck presidents, as their term draws to a close, begin to make way for their successor. They tend not to initiate significant new business, and on their last day in office, they are photographed leaving the White House for the last time, boarding the Marine One helicopter to begin the first leg of their trip to retirement, somewhere away from the capital. The stage of Washington is relinquished to the new president. President Barack Obama seems to have a different idea about how to end his second term in office and go into retirement. He has been making news with his last-minute efforts, including allowing a U.N. Security Council Resolution on Israel to pass that breaks decades of U.S. policy. These moves seem to be partly a bid by Obama to bolster his legacy and partly a signal that he intends to engage in partisan warfare up until the last minute, and perhaps beyond. The passing of Resolution 2334 was a surprise, coming on the Friday before Christmas and after the U.S. Congress had already adjourned. 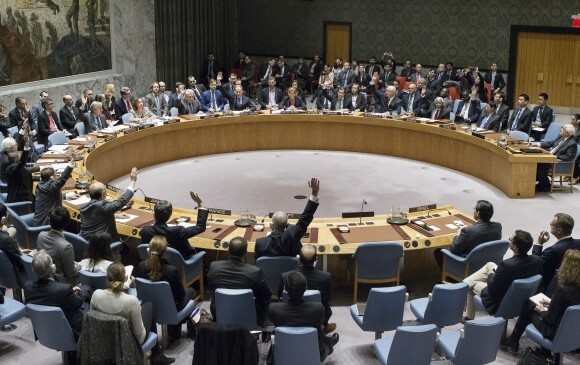 The vote was 14–0 in favor, with the United States abstaining. The United States has veto power in the Security Council, so a negative U.S. vote would have defeated the measure. The United Nations regards the West Bank and Jerusalem as territory conquered in war, which the Geneva Convention prohibits the conqueror from settling. Israel rejects this interpretation. Among several arguments, Israel says there has never been a legally recognized claim to the occupied territories and therefore Israel’s possession of them after the 1967 war does not fall under the Geneva Convention’s proscription. The passing of the resolution has been greeted with a firestorm of criticism from supporters of Israel. For decades, the United States has disapproved of Israeli settlements in the West Bank, but held the line that the disposition of these settlements should be decided by negotiations between Israel and the Palestinians—what is called the “two-state solution.” In 2011, the Obama administration vetoed a Security Council resolution regarding Israeli settlements in order to protect this principle. Critics have raised concerns that Resolution 2334 will, rather than encourage negotiations between Israel and Palestine, make the Palestinians less likely to negotiate, causing them to seek to obtain a state through the U.N. or through economic sanctions, which the resolution may encourage. The Obama administration’s position is that the number of settlements, and the increasing population of Israelis in the West Bank and Jerusalem, is growing so large that it is making the establishment of a viable Palestinian state impossible. Resolution 2334, if one believes it encourages the two-state solution, would seem to fit this plan. In a speech on Dec. 28, Secretary of State John Kerry rebuked Israel in unusually direct language for its settlement policy and said the U.S. abstention at the U.N. was meant to save Israel from the “most extreme elements” in its government. There is little likelihood of Resolution 2334 being rescinded. It will determine many nations’ policies toward Israeli settlements and affect peace negotiations for the foreseeable future. For U.S. presidents late in their terms to make last ditch efforts to obtain a peace deal between the Israelis and the Palestinians is not unusual. Ronald Reagan did this, as did Jimmy Carter and George W. Bush. But in these cases the peace efforts were not intended to foreclose what the next president could do. 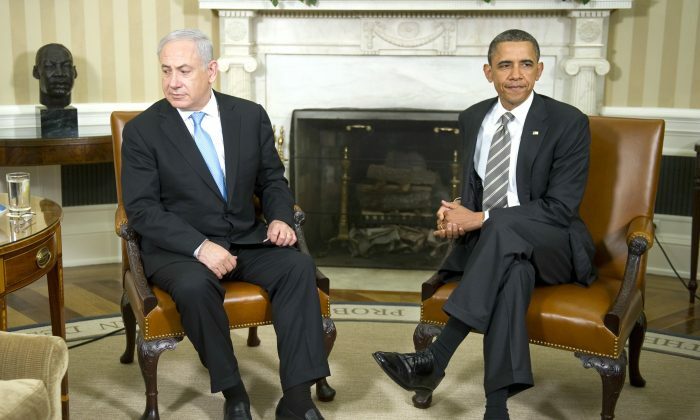 [Obama] is simply trying to limit his successor’s room to maneuver, whether it’s on Israel or on fossil fuels. Other recent efforts by Obama show him seeking to limit Trump’s freedom of action. On Dec. 20, Obama drew on a little-used provision in a 1953 law to ban in perpetuity drilling in vast swaths of the U.S. Arctic and Atlantic oceans. The Obama administration’s interpretation that the president can ban drilling forever is unlikely to hold, but while the courts work out this issue, there will be a roadblock for Trump’s plans to drill. Obama is also unleashing an avalanche of “midnight regulations”—regulations created during the lame duck period of an outgoing administration. Either the Trump administration will divert attention from working on its own agenda to reverse these rules, or it will give up and let some stand. According to Knott, the administration clearly views Trump’s election as a repudiation of Obama’s eight years in office, so they are trying to make Trump’s task of undoing the last eight years as difficult as possible. Moreover, Knott believes Obama’s loyalists expect Trump’s presidency to be a “historic failure.” “So they are setting the stage to make sure that historians and political scientists have a stark contrast to point to when the deluge comes,” he said. Obama’s lame duck actions are setting the tone for his exit from the White House, about which he has been of two minds. In any case, there will likely be no last ride on Marine One for the Obamas. They have bought a mansion a few miles from the White House, and their daughter Sasha has three years of high school to finish.